A few months ago, my 6 year old suddenly had a loose tooth. I felt like it went from a little wiggly to dangling by one tiny root in a matter of days although I think it was really weeks. A friend once told me that these would be the longest days but fastest years of my life. She wasn't kidding. 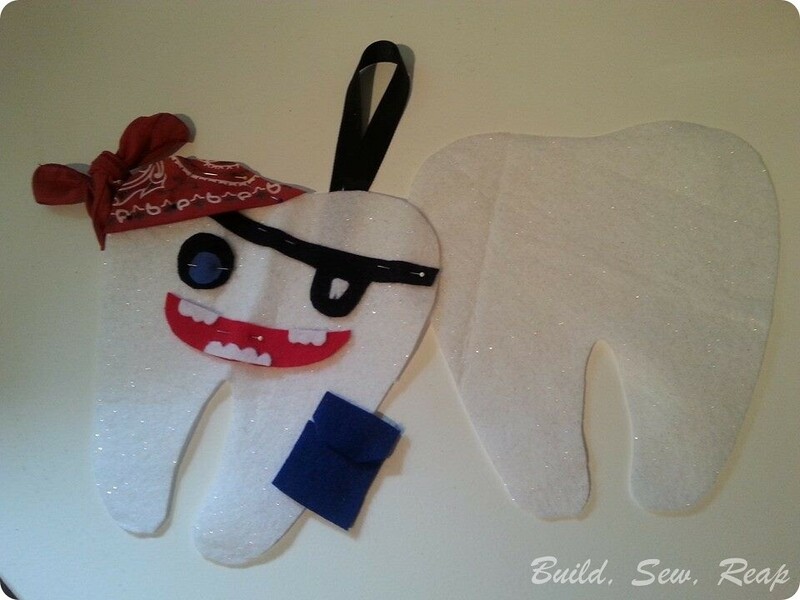 I have a kid who is losing teeth. When did he even outgrow his bassinet? 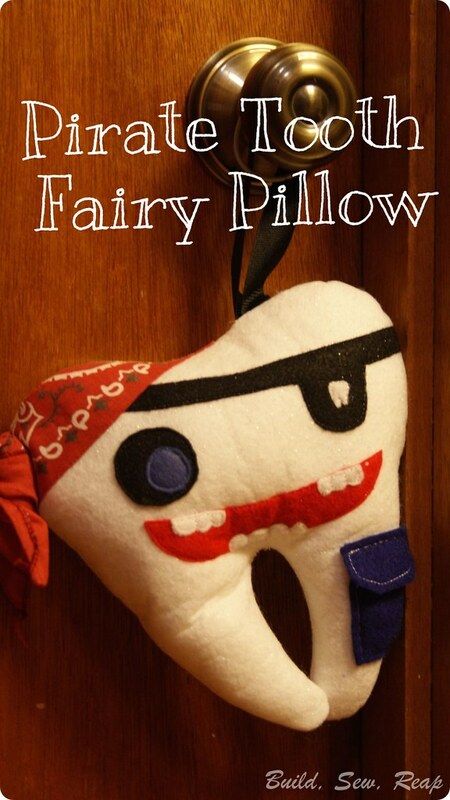 Anyway, my little tough guy and I took to Pinterest to find just the right tooth fairy pillow to hold his precious baby teeth and he saw a pirate tooth that he fell in love with. He took one look and said, "Wow, cool, I want THAT one." Unfortunately the link to the blog post from the pin doesn't go anywhere so I can't give credit where credit is due. To stitch this together, I first used my sewing machine to attach the mouth, teeth, eye, patch, and tooth on the patch using matching thread. Then I baste-stiched the UN-TIED bandana on his head. I then pinned the tie ends towards his face so they wouldn't get caught wrong when I stitched the two sides of the pillow together. Finally, I stitched the hanging loop to the top edge (when you do this, make sure the loop is facing down with the cut ends up, that way when you turn the project in the end, the loop will be on the outside of the pillow). I top stitched just the pocket flap with white thread (not in place, this was separate from the tooth pillow). I laid the two tooth pieces with right sides together and stitched along the side where the pocket would be. I opened the two pieces back up and stitched the pocket in place, wrapping it across the seam. I then pinned the front and back with right sides together and stitched nearly all the way around, leaving a hole along one side to turn the pillow. I turned the pillow right side out and stuffed it then hand stitched the hole. He lost his tooth 2 days later. 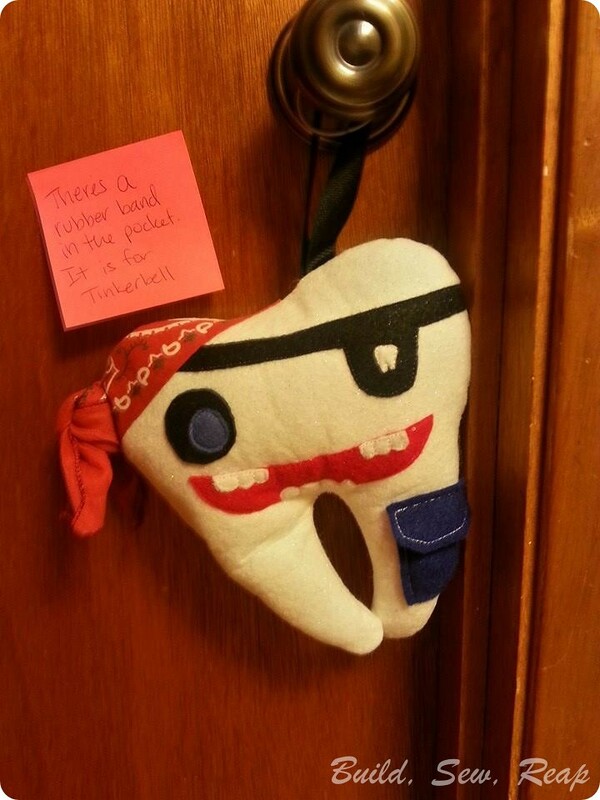 He tucked his tooth and one of my hair bands in the pocket and had me write a note to the tooth fairy to tell her the hair band should be delivered to Tinkerbell.